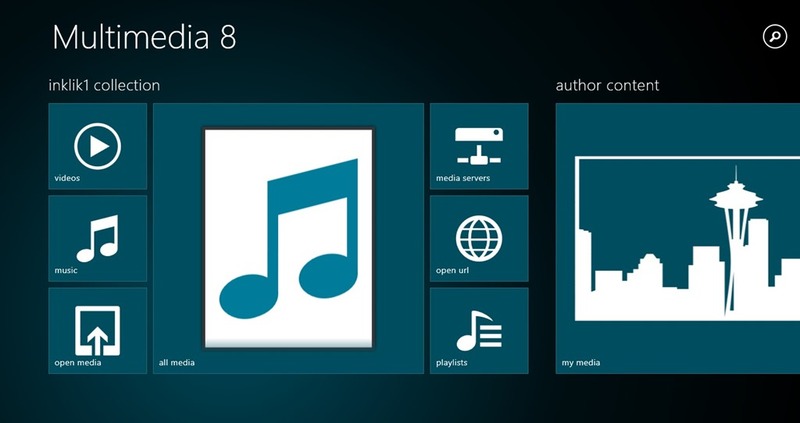 Multimedia 8 is a free Windows 8 Media Player to play multiple type of audio and video files on your system. You get the ability to browse and listen to songs which are available on your hard disk or you can access music from the web. You even have the ability to read subtitles while listening to your audio or video file. In addition to all these, you have the capability to play audio or video files from your main media server. This free Windows 8 Media Player also allows you to manage your playlists or even convert your music files from one format to other, like MP3, WMA, and M4A. The player even gives you the ability to capture audio or video using your compatible devices like webcam. Let’s get you a better idea of this free Windows 8 Media Player. 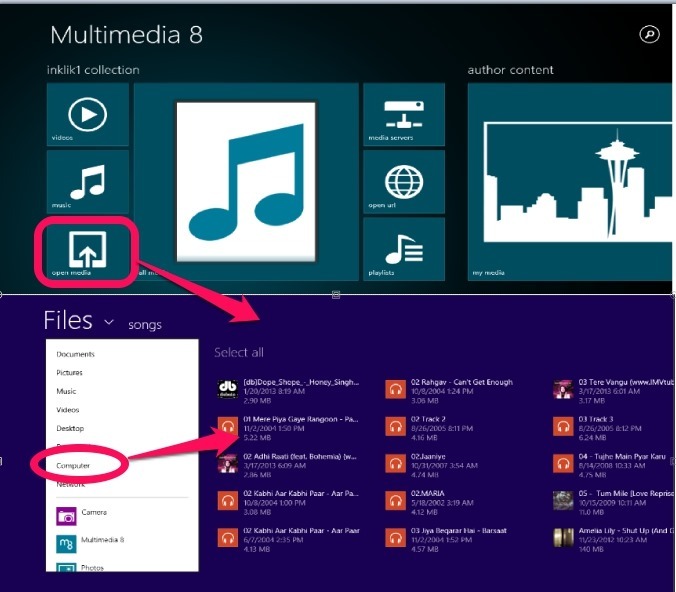 In order to play any audio or video using this Windows 8 Media player, you first have to locate the particular music file using the ‘Open Folder’ option on the main screen of Multimedia 8. That particular audio or Video file will then be opened by this free Windows 8 Media Player. Now, when you play any particular file from this free Windows 8 Media Player, you will be having the capability to change that particular track to other formats. The available formats to which you can convert to, using Multimedia 8 are MP3,M4V, and WMA. A floppy like symbol would be seen when your media file is playing. If you click on it, the media player will show you the formats to which the Media Player can convert to. You can choose from MP3, M4V, and WMA formats. 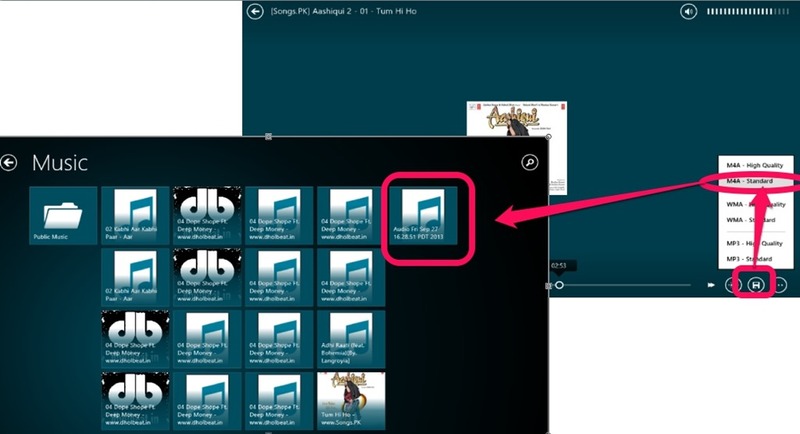 This free Windows 8 Media Player will Store your Converted files in Music folder, which can be reached right from the main screen. In this free Windows 8 Media Player, you even have the ability to play music from your Media Server. In order to enable this Media Player to play Music from your Media Server, you firstly have to pair your Media Server with your system. For that add your Media Server using the ‘Add New Device’ from the Control Panel Settings of your System. When your Media Server is added, it will be available under the Media Servers icon on the main screen of this free Windows 8 media player. The icon on being clicked, will show you the available Media Servers. There’s one more way of accessing music from your media servers within the app. This method also follows adding the Media Server using your System’s setting. Then you can use the Search Charm on your system and can access any particular Media file which is available on that Media Server. Or, after adding that particular Media Server, if you click on the Open Media functionality of Multimedia 8, you can locate that file and can play that Media file. You even have the ability to read subtitles in this free Media Player. Use this functionality to include subtitles in your Audio and Video Files. The option for adding subtitles appears on clicking the bottom-right icon while playing files. Nice User Interface: The interface of Multimedia 8 is quite nice and easy. Load and read subtitles while listening or watching Media Files. Support for playing 3D video. Capture Audio or Video using Multimedia 8. Convert media in supported formats. Finally, I would like to say that this free Windows 8 Media Player is quite nice to use. Its Interface is quite nice and smooth . The ability to play the Subtitles of any media is quite good. Though the functionality of playing files from selected Media Server did not work properly during my testing, you would have to figure out whether it works for you or not. All in all, it’s a good Media Player and worth a try.